North Uist, Scotland.. 26 Jun 2016. © C.F.Carter (chris.carter at 6cvw.freeuk.com). Red-cyan anaglyph showing 3D structure, North Uist, Scotland.. 26 Jun 2016. © C.F.Carter (chris.carter at 6cvw.freeuk.com). Red-cyan anaglyph showing 3D structure,North Uist, Scotland.. 26 Jun 2016. © C.F.Carter (chris.carter at 6cvw.freeuk.com). 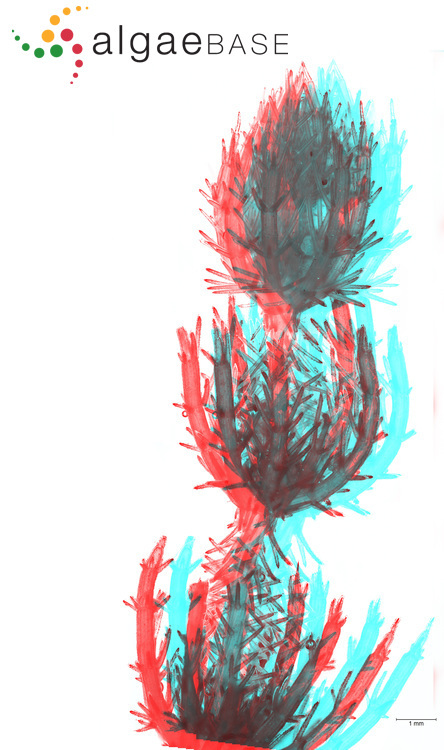 Red-cyan anaglyph showing 3D structure. North Uist, Scotland.. 26 Jun 2016. © C.F.Carter (chris.carter at 6cvw.freeuk.com). Chara baltica (C.J.Hartmann) Bruzelius Red-cyan anaglyph showing 3D structure, North Uist, Scotland. Published in: Bruzelius, A. (1824). Observationes in genus Charae, quae venia ampliss. Ord. Philos. Lund, p.p. respondente Eberhard Liljevalch. pp. 1-24. Londini Gothorum: ex Officina Berlingiana. 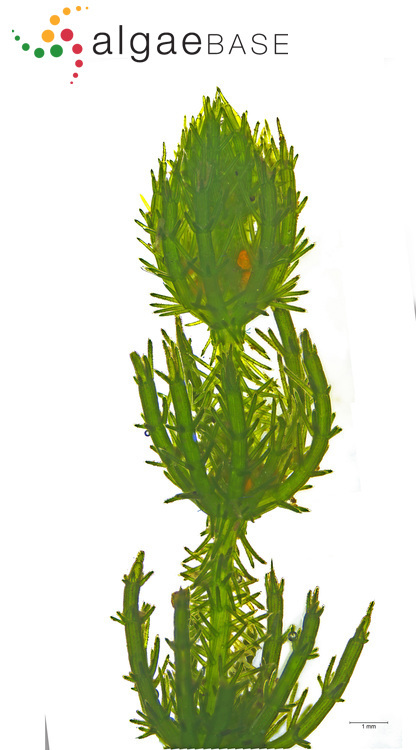 English: Baltic Stonewort (Stewart & Church 1992). Swedish: Grönsträfse (Tolstoy & Österlund 2003). The plants are up to 50 cm long, they are not encrusted and therefore green. The axis is to 0.5 -1 mm in diameter. The branchlets are 6-11 in a whorl, each with 6-9 segments. The stem cortex is diplostichous, tylacanthous. 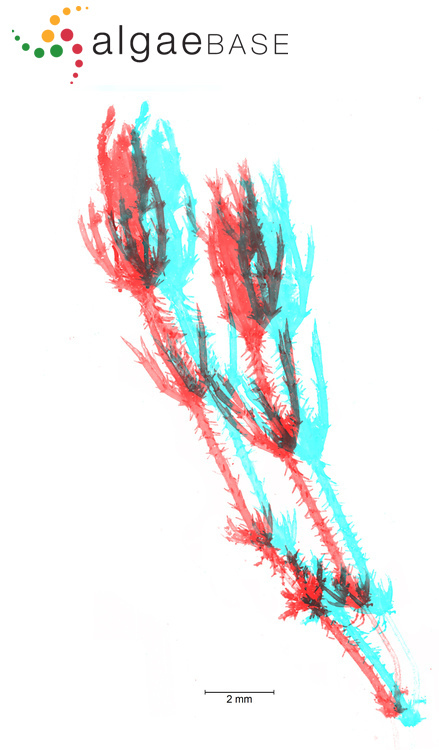 The spine cells are normally solitary, occasionally in pairs and usually shorter than the stem diameter. The stipulodes are in two regular rows. The bract cells are 5-7 and the bracteoles are longer than the oogonium. The plant is monoecious. 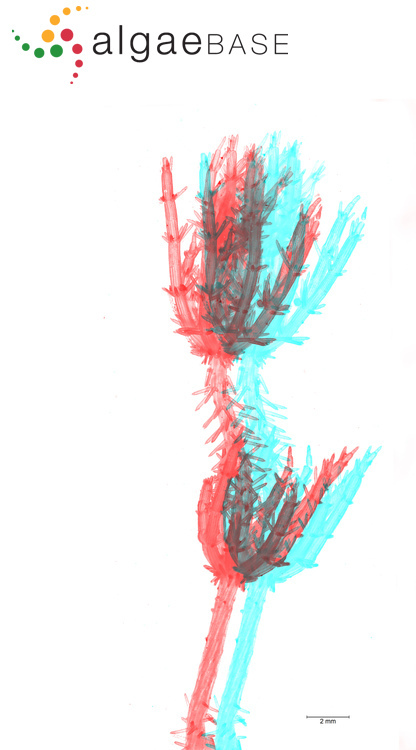 The gametangia are conjoined at the lowest 1-3 branchlet nodes. The oogonium is up to 1.2 mm long. The oospore is black. 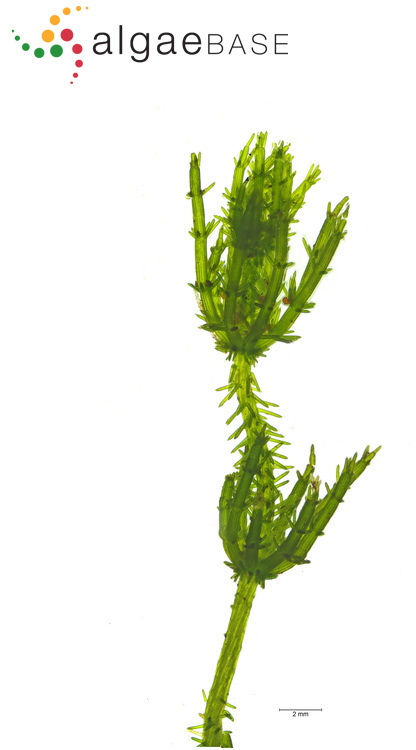 The antheridia are up to 500-800 m in diameter. Multicellular bulbils are found in the autumn. 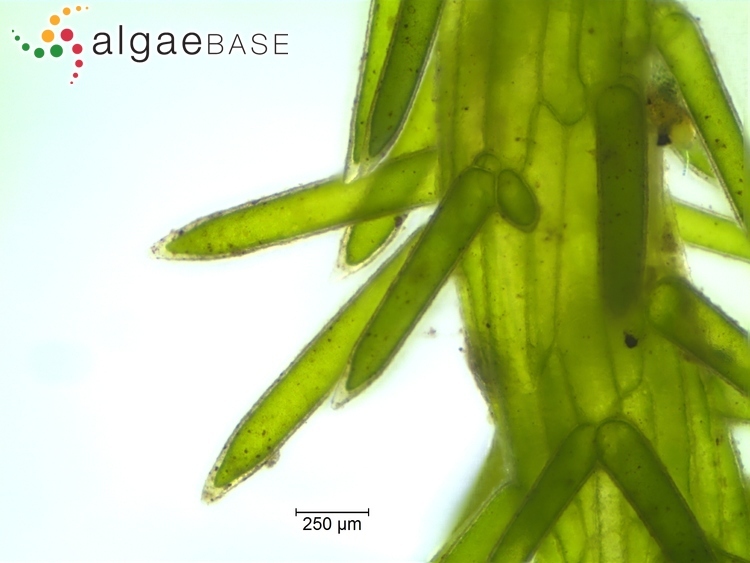 Chara baltica is a brackish water species, found in salinity between 2- 10 PSU. The species is frequent in the Baltic Sea, and is elsewhere found in coastal lagoons and fiords. It grows on muddy or sandy bottom, from 0.1  4 m depth. C. baltica has both annual and perennial forms, depending on the depth of growth. The annual forms hibernate by bulbils or oospores, while the perennial forms has oospores, swollen nodes Nacktfüssige Zweige or green plants. Fertile plants are found from June to October, but the fertility is normally low. Ripe oospores can be found from July. Blume, M., Blindow, I., Dahlke, S. & Vedder, F. (2009). Oospore variation in closely related Chara taxa. Journal of Phycology Journal of Phycology(5): 995-1002. Blümer, C. (2004). Taxonomy and nomenclature. In: Charophytes of the Baltic Sea. (Schubert, H & Blindow, I. Eds), pp. 261-284. Moore, J.A. (1986). Charophytes of Great Britain and Ireland. B.S.B.I. Handbook No. 5. Illustrated by Margaret Tebbs. Distribution maps prepared by Dorothy Green. pp. [i-ii], 1-140, 26 figs, 17 maps. London: Botanical Society of the British Isles. Muller, S, D., Rhazi, L. & Soulie-Märsche, I. (2017). Diversity and distribution of Characeae in the Maghreb (Algeria, Morocco, Tunisia). Crytogamie Algologie 38(3): 201-251. Nowak, P. & Schubert, H. (2019). Genetic variability of charophyte algae in the Baltic Sea area. Botanica Marina 62(1): 75-82. Schneider, S.C., Rodrigues, A., Moe, T.F. & Ballot, A. (2015). DNA barcoding the genus Chara: molecular evidence recovers fewer taxa than the classical morphological approach. Journal of Phycology 51(2): 367-380. Schubert, H & Blindow, I. (2004). 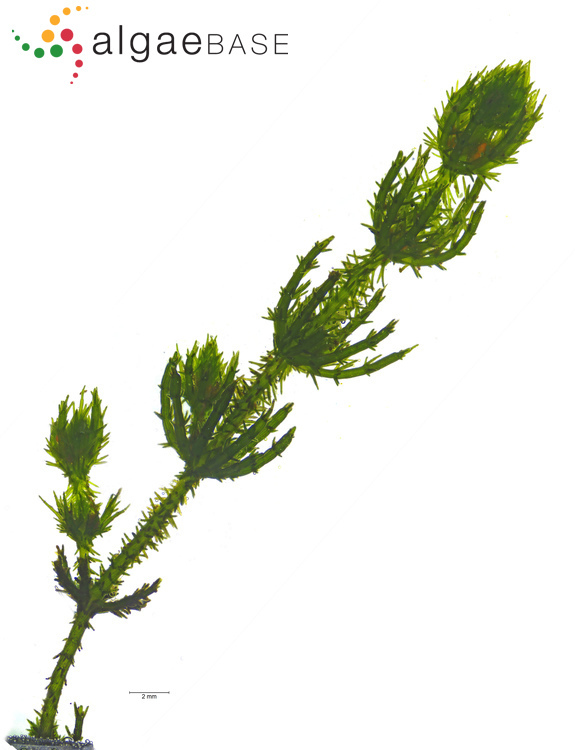 Charophytes of the Baltic Sea. . Ruggell: A.R.G. Gantner Verlag Kommanditgesellschaft. Urbaniak, J. & Combik, M. (2013). Genetic and morphological data fail to differentiate Chara intermedia from C. baltica, or C. polycantha and C. rudis from C. hispida. European Journal of Phycology 48(3): 253-259. Accesses: This record has been accessed by users 5418 times since it was created. Blindow, I. & Erichsen, I. (2010). Cross-fertilisation within the Chara baltica species complex. Charophytes 2(2): 59-65. Boegle, M.G., Schneider, S.C., Melzer, A. & Schubert, H. (2010). Distinguishing Chara baltica, C. horrida and C. liljebladii- conflicting results from analysis of morphology and genetics. Charophytes 2(2): 53-58.